Robotics is one out of several technology trends making its way into our industries and transforming the way these industries operate. It has helped to streamline processes and make the journey of a product to its customer a smoother one. It has been predicted that much of the logistics and transportation industries will face rapid growth in the coming years with the growth of e-commerce. However, currently, about 80% of the warehouses are operated manually by humans with little or no automation support. This statistic can be changed to make work within warehouses a lot easier with the introduction of robots. The question is, how can robots help in the logistics industry? Robots work alongside employees to assist in assembling goods in an efficient manner. Robots can take up tasks that are dangerous, boring or repetitive, thus leaving humans to work on activities that require thinking and decision making. This greatly enhances the productivity of employees and helps them focus on and accomplish more important tasks. With the use of robots, the logistics industry will be able to provide high quality and quicker service to their customers. Loading and Unloading of containers: Much of the goods transported from Asia to the Americas and Europe are shipped in standardized containers. To minimize transportation costs, most of these goods are usually stacked from floor to ceiling without the use of pallets in the ships. On arrival to the port, these goods are unloaded from the ship by hand. They are also sorted and stacked onto pallets to be taken to the warehouse. This process is extremely labor-intensive and can take several hours to complete. In order to tackle this issue, in 2003, DHL came up with a prototype called Parcel Robot which consisted of a 3D laser scanner, a telescopic conveyor belt, a robotic arm and grabber and a chassis, which performed this rather time-consuming and manual task, without any human intervention. Stationary Piece Picking Robot: Traditionally, employees walk around the warehouse and put together all the items for an order. In order to save labor, the company Kiva that builds mobile robots was bought by Amazon. They later build robots that can pick up an entire shelf of goods and bring it to the picker who would then pick whatever is needed. The next robot would then come and the process would continue until the entire order has been completed. Mobile Piece Picking Robot: An alternative to stationary piece picking robots would be to have a mobile robot that goes around the warehouse and picks items itself, just like a human would do. Much of the companies are working on creating robots to do just this to increase efficiency and reduce labor. Custom and co-packing: During certain times of the year, there may be sales or discounts and during this time, much of the items require custom packaging. This may be a difficult task to be done by robots because they don’t work with the same size of items and they work alongside humans. This may be risky as robots need to be designed to work safely around humans. This is why collaborative robots (also called cobots) have been developed. Cobots are extremely safe robots as they have no sharp edges and they shut down immediately when they bump into something. Robots are providing benefits in many aspects including safety and efficiency of work when it comes to logistics and transportation. 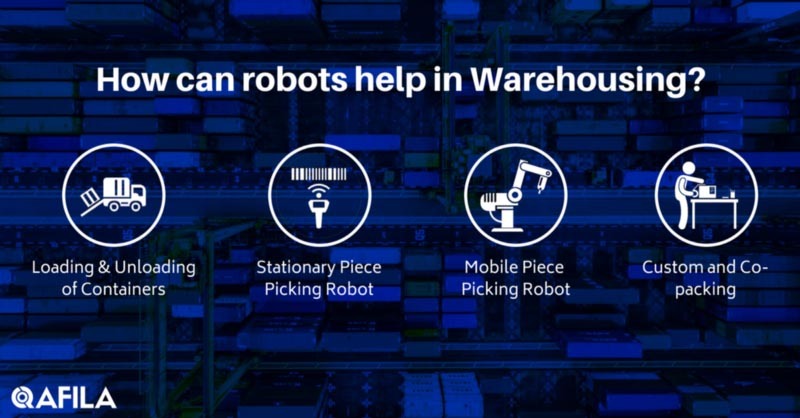 The use of robots will not only help employees in the industry who are involved in warehousing but also the end customers as the service is far quicker and accurate.